Home » Posts tagged "Balance Wheel of Sewing Machine"
What is a Sewing Machine? A sewing machine is a unique designed machine which is used for stitching different parts of fabric together to make garments products. Sewing machines are used in both lather and apparel industry. The main functions of sewing machine are sewing fabric or any other parts of materials. Earlier people used to sew by hand but after the industrial revolution mechanical machine was created which is a handheld sewing machine. Because of continuous development now we have automated sewing machine available for home use, commercial use and industrial use. Although basic sewing functions remain the same, the pattern of stitches are different and improved one. 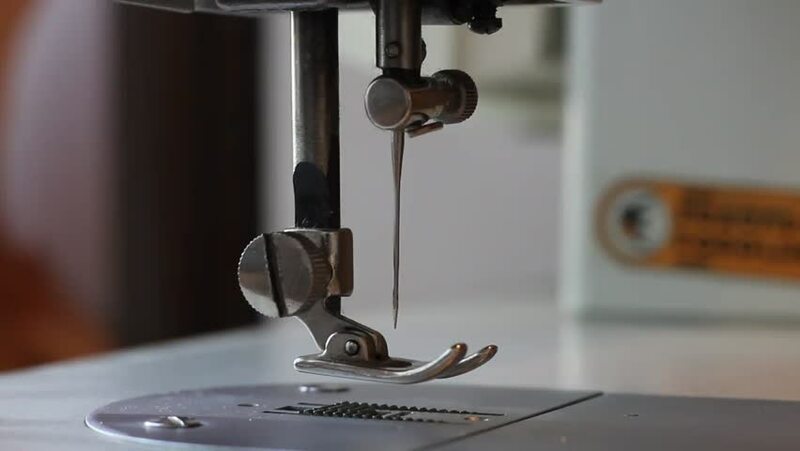 By using the modern sewing machine, you can put different types of the stitch as required. For a good finished product, you need to buy a good quality sewing machine, either you can buy manual or automated. For personal use, you can buy a handheld sewing machine. Now with a modern machine, you can not only sew your cloth but also can do embroidery. A good quality thread is required for getting better finishing and sewing strength. Here I will discuss all the different parts of a sewing machine both for the traditional and modern, manual and automatic sewing machine and also Sewing Machine Parts: Name, Functions, Sourcing, and Maintenance at a glance. You may think about what brand you should choose among available sewing machine brands. My suggestion for you first determines for what purpose you are going to purchase the sewing machine. There are many popular sewing machine brand available out there. Brother, Juki, Singer, and Janome are the most widely used brands. If it is for home, use purpose then singer machine you can purchase. You may find, for industrial garments production Juki, Brother these two brands are highly used. To get long-term service from a sewing machine, you have to take care of it. Regular maintenance and cleaning are necessary. You also need to put lubricants or oil into the required parts. Sewing Machine Parts can be imported from China or buy from the local market. 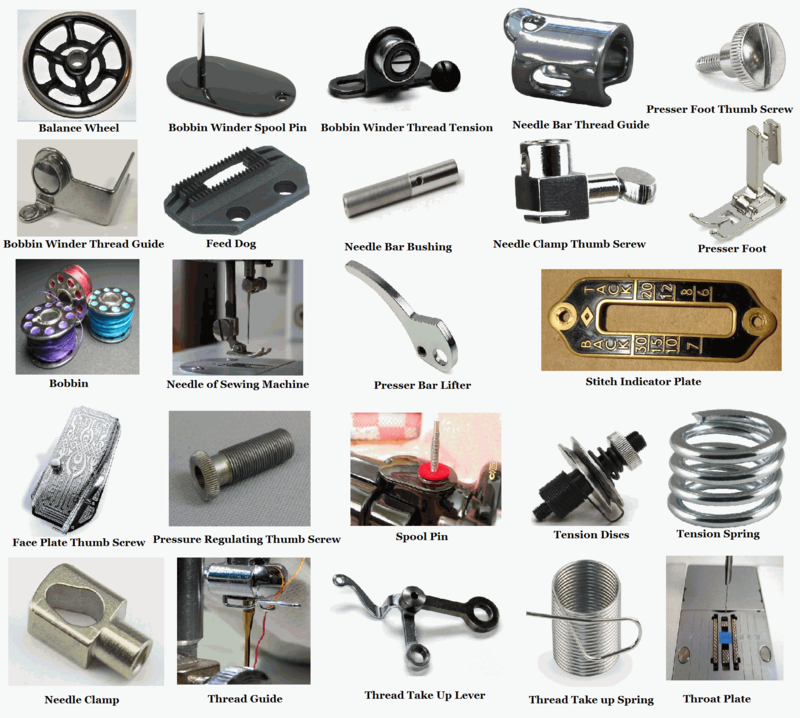 Needle, bobbin, bobbin case, oil, and lubricants are commonly used parts and maintenance materials. In a traditional handheld sewing machine and a semi-auto sewing machine, you can see that there is a wheel on the top right corner of a sewing machine. Basically, it is used to run the machine manually. A needle is a sharp metal, very sharp in nature which has a small hole (eye) in which a thread go through. Basically, a needle is used for sewing. In a sewing machine, a needle is attached. In a needle, you may find 5 parts. They are a shank, Shaft, Front Groove, Point Scarf, and eye. For woven fabric and denim, lather, knit fabric, different types of Needle are used. Needle made of steel coated with chrome or titanium. sewing machine needle is mainly sourced from China because of a cheap price. So can also source it locally if the order quantity is less. Spool pin in a sewing machine is placed vertically or horizontally which actually used for holding the spool of threads. This is a fixed part of a sewing machine. 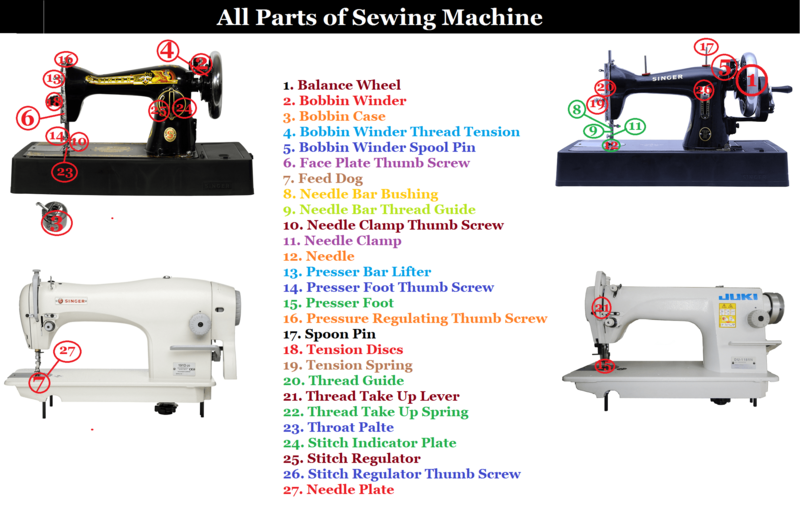 In a sewing machine bobbin is one of an integral part and it is non-electrical parts of a sewing machine. Bobbins can be found in different electric devices. In a bobbin, threads are wired which is used for sewing. You need to set the required thread into a bobbin. After finishing you have to refill the bobbin to continue sewing. Bobbin holder is used to holding the bobbin into the sewing machine. Bobbin holder also is known as bobbin case which is one of the key sewing machine parts. Time to time you may need to conduct cleaning and maintenance or change of bobbin case. It is one of the commonly used spare parts of a sewing machine. A presser foot using in a sewing machine to hold the fabric in the right place on the throat plate so that fabric cannot slip around. You may need to change your sewing machine pressure foot if you use your machine for commercial production. The tension discs used to control the thread tension to give proper stitch on the fabric. If there is a problem of tension then you may see that stitch is not placing properly, it may loose or tight. Tension spring is added to control the pressure so that two different fabric can join together with proper stitch. 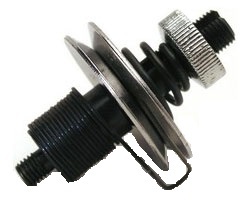 Tension discs and spring may need to change if it is damaged. You can purchase it locally or source it from China if you need a large quantity. Remember that you have to clean dust time to time from the tension discs otherwise, you may find improper stitch. The faceplate thumb screw is used for attaching the face plate of a sewing machine. You may find it a traditional sewing machine. Normally, this part is not required to replace. Thread guide is a small part of a sewing machine which has a hole inside, is responsible to properly guide the threads from spool pin to the hole of a needle. Thread guide is made of steel or metal. Throat plate is placed between pressure foot and bobbin case. This plate also is known as needle plate. It is made of metal. At the time of sewing, pressure foot is placed on top of the throat plate. Stitch Indicator plate indicates the stitching type where different stitching number is written. This plate is a fixed part of a sewing machine which is not required to change but you should clean the surface of the plate so that written number is visible. By using a stitch regulator you can regulate the type of stitch on the fabric. In accordance with your requirement, you can switch into a different stitch or adjust your sewing stitch. Bobbin winder basically ensures the right direction of the threads from the spool to the bobbin. This is a mechanical process which is done automatically inside the sewing machine. Feed dog helps to feed the fabric to the required direction, either backward or forward using its teeth. Feed dog is made of metal. Normally it is not a visible part of a sewing machine. But if you look closely into the needle plate then you can see. If feed dog is damaged then you must need to change it. Finally, a sewing machine should be properly maintained to get long lasting service. If you do not clean and add lubricant properly then you may find a technical problem or not functioning properly. Different defects you may identify. How you can ensure proper maintenance? First, read the manual provided with the sewing machine and follow the guidelines for setting the machine and starting sewing. Please clean after using if there is any dust. Regularly put good quality lubricants to the right place. If you have any confusion or you want to add value to this article then please let me know.